If you’re ready to discover the SIMPLE HABITS that will help transform your body and support you to establish the balanced, healthy lifestyle you desire, you’ll want to join us. How to easily incorporate simple habits and food choices that will help you live a healthier lifestyle, without adding more time-consuming tasks or unnecessary stress to your life. Tons of FUN, guidance and support from a Registered Dietitian (that’s me!). Lots of support and encouragement needed to develop healthy habits that will last a lifetime, one day at a time. 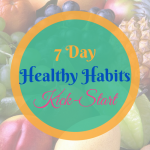 Over 7 days I’ll share with you some great nutrition and lifestyle tips, information, inspiration, and motivation to support you kick-start your fitness goals and feel better FAST! No worries, your email is safe with me!